This post was originally published on February 12, 2011 and was updated recently with photos and updated text. 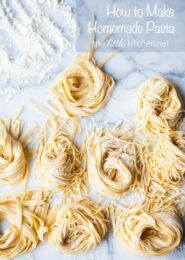 We love this recipe and make it at least once a month…it’s a tried and true & very tasty recipe, I know you’ll love it! Last week I shared with you this wonderful Whole Chicken in a Slow Cooker recipe and now I’m going to show you what I did the leftovers. I made chicken pot pie. And what better way to find a recipe than to tweet about it and see what other food bloggers say their favorite recipe is. 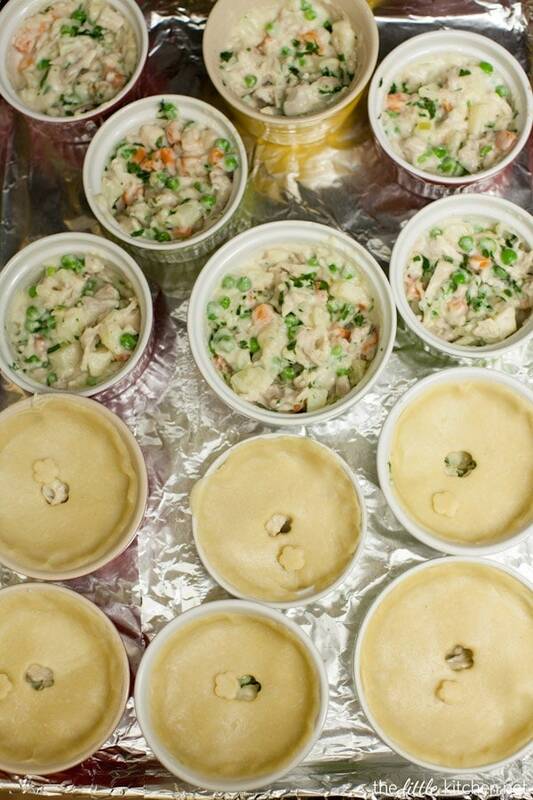 I actually put a call out to twitter asking about people’s favorite chicken pot pie recipes. I received a few replies including one from (my now dear friend) Lindsay. 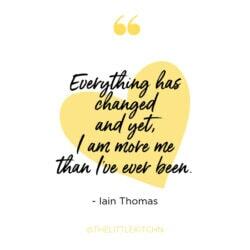 I love Lindsay and her blog so I went investigating. 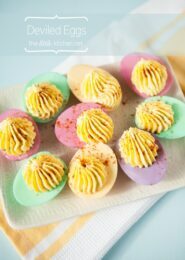 The recipe seemed relatively simple and the bulk of the work is the prepping of the ingredients. The only problem was that I didn’t have a whole set of ramekins nor do they match. But oh well, that didn’t stop me. I had to go out and get two more ramekins and it ended up working out. The recipe she used is based on Chef Emeril’s recipe for turkey pot pie but it was easily changeable to be a chicken pot pie. After we had the slow cooker chicken recipe, I took the rest of the chicken left over and cut into smaller than bite size pieces and put into a plastic container – you need about 2 cups. This chicken pot pie was so amazing. It’s going to be our regular after we make the slow cooker chicken recipe, always. 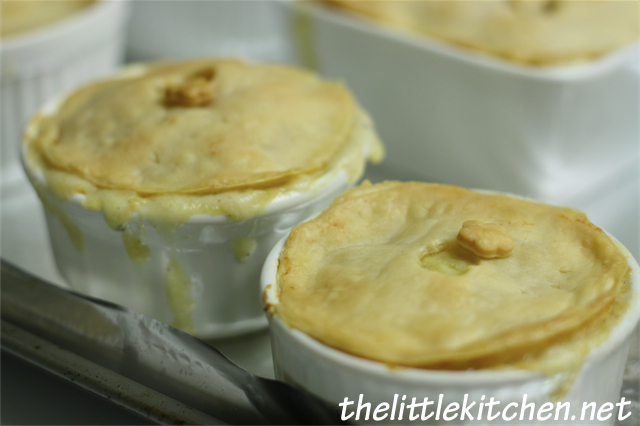 (Original photo from February 2011) As I’m writing this post, I really wish I had a ramekin or two of this chicken pot pie right now! Filling is done! Have a taste of the filling (it’s so good, I could have just eaten it like this) and season with salt and pepper. When I first made this recipe back in 2011, I had different size ramekins, some bigger than the ones I have bought since then. 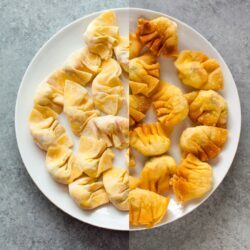 So depending on how many you have and the size, you might get the filling into a less number of ramekins or a larger number! I pinch the pie dough against the sides of the ramekin and don’t you like the little mini blossom flower cut outs? I use a similar to this one made by Wilton. Mine is also made by Wilton but it doesn’t have the super convenient push tab to push out the shape. You want to cut a little vent hole whether it’s with a knife or even another shape before baking. This recipe takes a little bit of prep work but everyone I know who has made it, says it’s worth it. Curtis and I love this recipe to pieces. 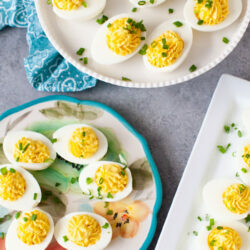 Serve it with a salad and you have a complete dinner! 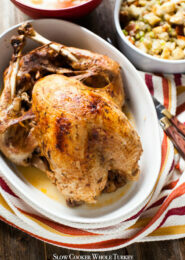 Turn on oven to preheat at 400 degrees F. If using a baking pan (such as a 9x9x2), grease it. Or if using ramekins, ready your ramekins (I generally use 7 to 12, all different sizes). Place baking pan or ramekins on a baking sheet covered in foil (the ramekins do not need to be greased). Bring a small pot of water to a boil. Add diced potatoes and carrots and boil for about 4 to 5 minutes. Drain and set aside. Melt butter in a large saute pan over medium heat. 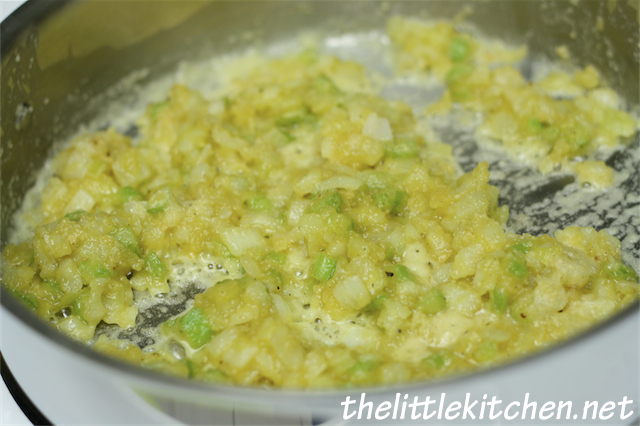 Add onions and celery as well as salt and pepper. 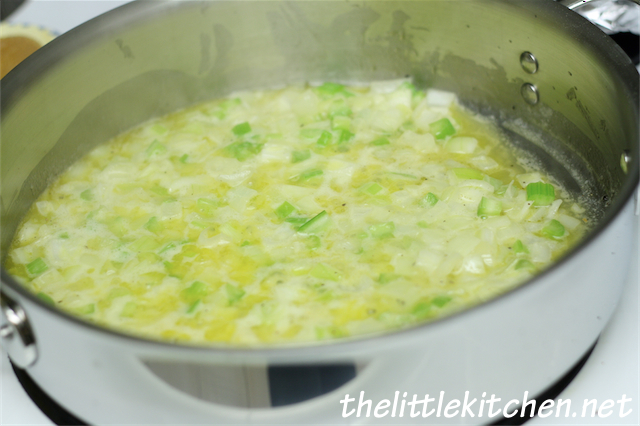 Allow the onions and celery to for 2 minutes, stirring constantly. Add flour and stir constantly for 3-4 minutes to make a blond roux. Add chicken broth while stirring constantly. Bring it to a boil then turn the heat down to medium-low. 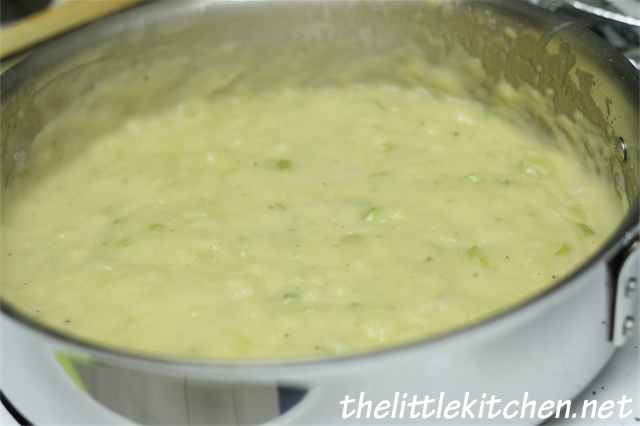 Allow it simmer until the sauce thickens, about 4 to 6 minutes. Add half and half while stirring. 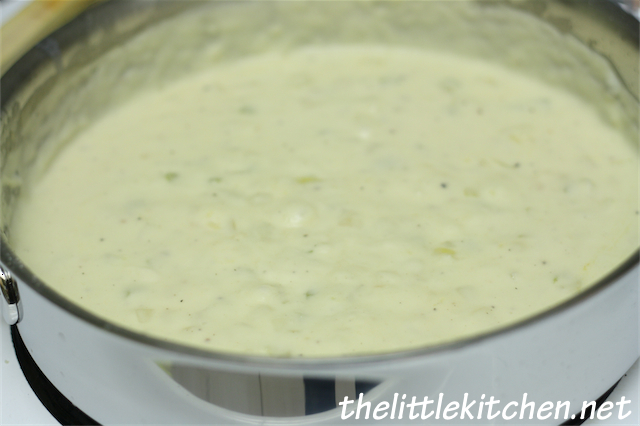 Allow filling mixture to cook for 4 minutes and stirring occasionally. Add salt and pepper to taste. Add the rest of the vegetables (potatoes, carrots, peas), the chicken and parsley. Add salt and pepper to taste and make sure all vegetables and chicken are incorporated well. If using a baking pan, line it with one of the rolled out pie crusts. Pour the filling into the prepared pan or divide equally into ramekins. 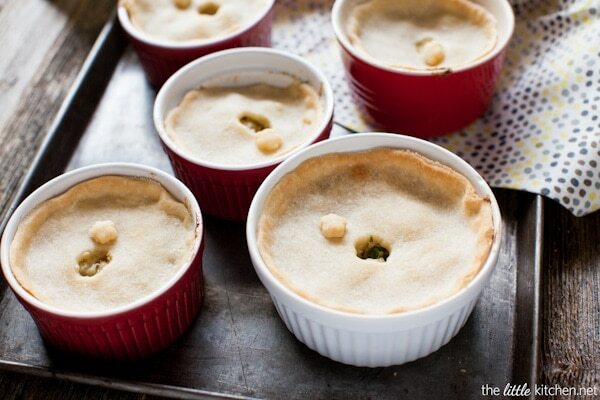 If using a baking pan, cut vent holes and place the second crust on top of the filling. If using ramekins, roll out and cut out dough (I used the ramekins, flipped them upside and used them as a cutter) and cut out vents (I used a Wilton flower blossom cutter). Fill the ramekin with filling and then add the pie crust on top. 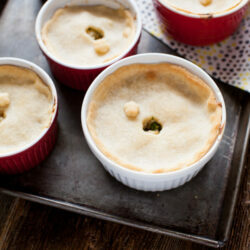 Tuck in crust(s) into the pan or ramekins and pinch the edges against the sides of the ramekins. Place into oven on covered baking sheet. 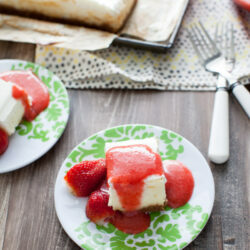 Bake until the crust is golden brown and crusty, 25 to 30 minutes (18-20 minutes if using ramekins). Let cool for 5 minutes before serving. Preparing the filling on the stove doesn’t take that much time, the prepping of the ingredients does though. So it’s very important to prep everything before you heat the pan on the stove! 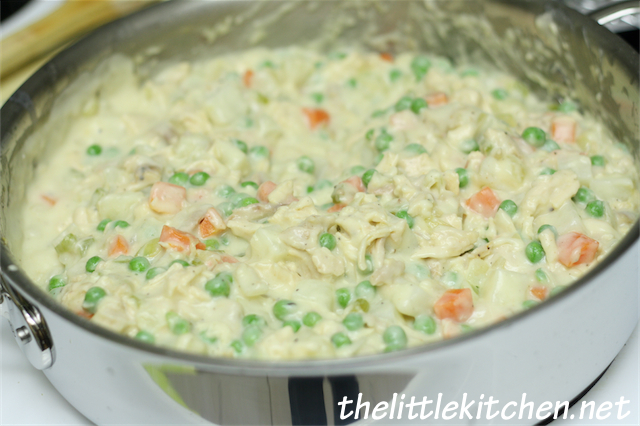 I just adore this recipe for chicken pot pie and it’s going on regular rotation in our house. It’s one of the perfect comfort foods. 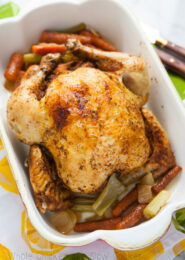 So what do you like to make with your leftover chicken when making recipes like the slow cooker chicken, roast chicken or rotisserie chicken? Disclosure: There’s an affiliate link in this post. Hello Julie! I’ve made chicken pie with so many recipes and yours is the best so far! I used leftover grilled chicken and the serving was enough for an entire pie! My husband and son ate 3 servings, they’re the real litmus test of my cooking. I will subscribe and share because you have something really special here. Thank you for sharing! 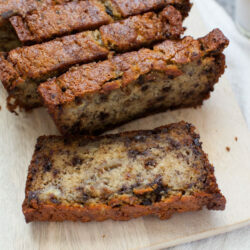 Holy smokes, this was incredibly delicious and incredibly easy! Thank you so much. I have the huge task of cooking LOTS of chicken as my freezer broke and contents were partially defrosted. So i was wondering as I have way more than needed (about 8 chickens) !!! 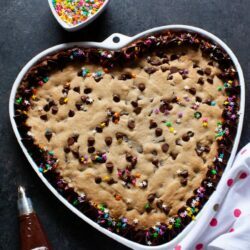 would this recipe freeze well? What size ramekin should i use? These pies are so beautiful! Yummy! I am not well, so I would love such pie. Great comfort food! 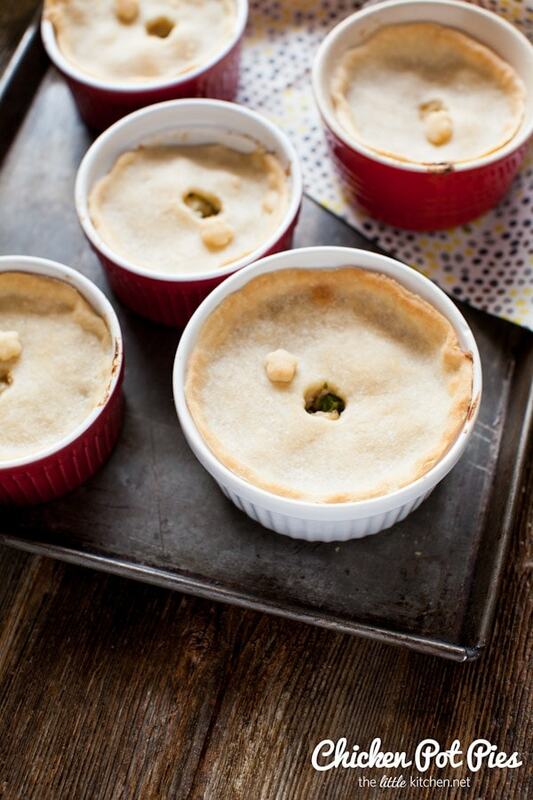 I love pot pies and can’t wait to try this. I used to bake a chicken a week now I just pick one up on the way from work. 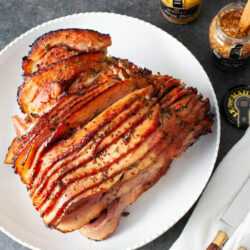 There are always leftovers even after setting aside slices for sandwiches. I’ll have to try this without the half and half and use lactose free milk instead. I love the richness of cream but with two lactose sensitive kids I cook with treated milk or yogurt. I adore chicken pot pie even in the summer! Fantastic and easy peasy. Thanks! Sounds great and very easy. However, for your many fans in Europe, can you explain what ‘half and half’ is? Hi Lorcan, it’s half milk and half cream…in the UK it’s called half cream. Hope that helps! You can probably use milk or even almond milk! The next time we make it, we’re going to try almond milk. I’m wondering why there is no other seasoning besides salt & pepper. I would think it might be a bio bland. I always add up to a tbsp. of poultry seasoning and a 1/2 tsp. of thyme. I get rave reviews for my potpie. I’d love to see you try a beef pot pie. 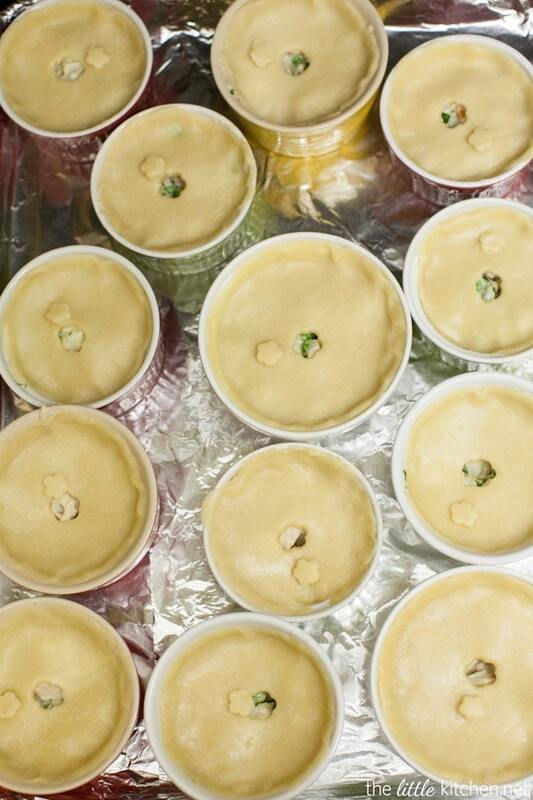 In my younger days, I enjoyed the frozen (admittedly highly processed) Banquet and Swanson beef and chicken pot pies. Homemade is so much better for us, right? 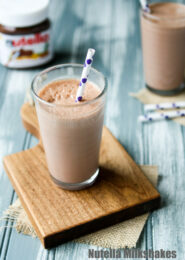 It’s definitely not bland…and has great flavor…it’s our go to recipe. 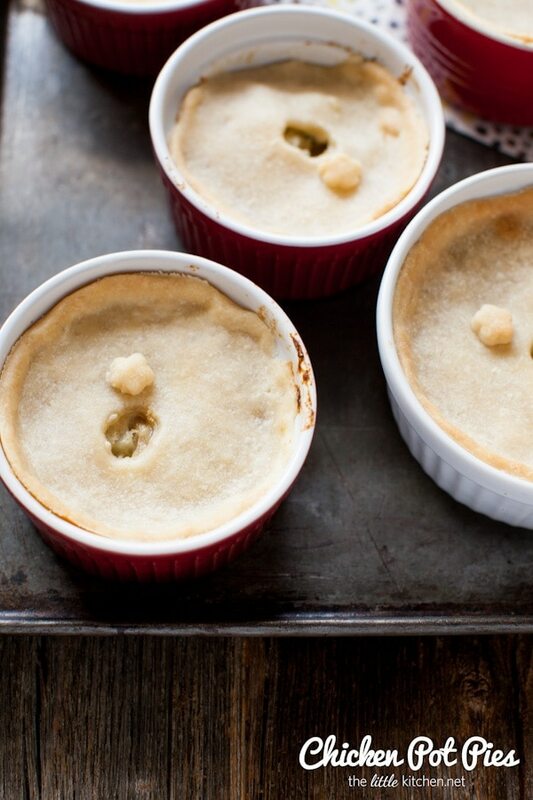 I have been wanting to try to make a beef pot pie forever…I’ll let you know if I try one out that I like or develop one that’s good enough to share on the blog.